Sausage provides an extra savory element to these cheesy, spicy jalapeño poppers. In a skillet over medium heat, cook bacon to crispy. Crumble and set aside. Shred cheddar cheese and mix with cream cheese, pimentos, mayonnaise, salt, and paprika. Add sausage and stir to incorporate. Halve and core jalapeños, and fill each half with a tablespoon of filling. 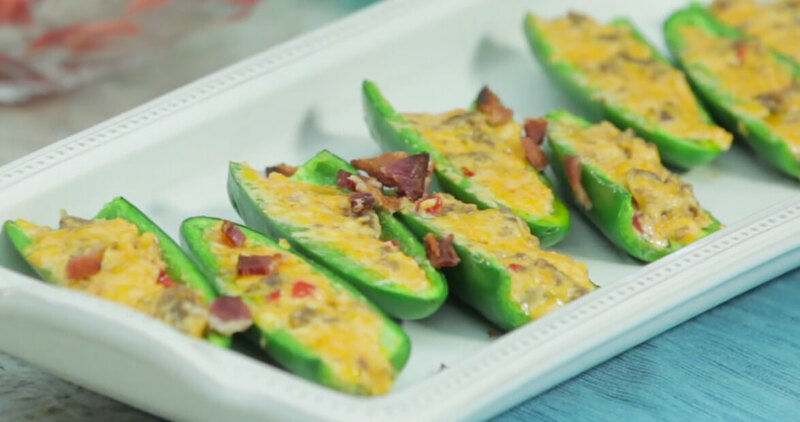 Arrange stuffed jalapeños in a baking sheet. Bake for 17-20 minutes or until peppers have softened and cheese is golden and bubbly. Top peppers with bacon and cilantro and serve hot.